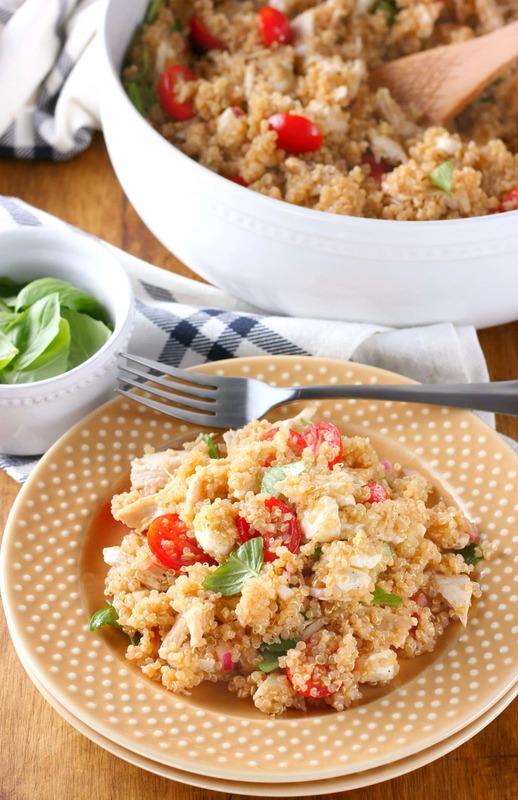 This hearty, healthy Chicken Caprese Quinoa Salad is filled with juicy tomatoes, creamy mozzarella, and fresh basil! 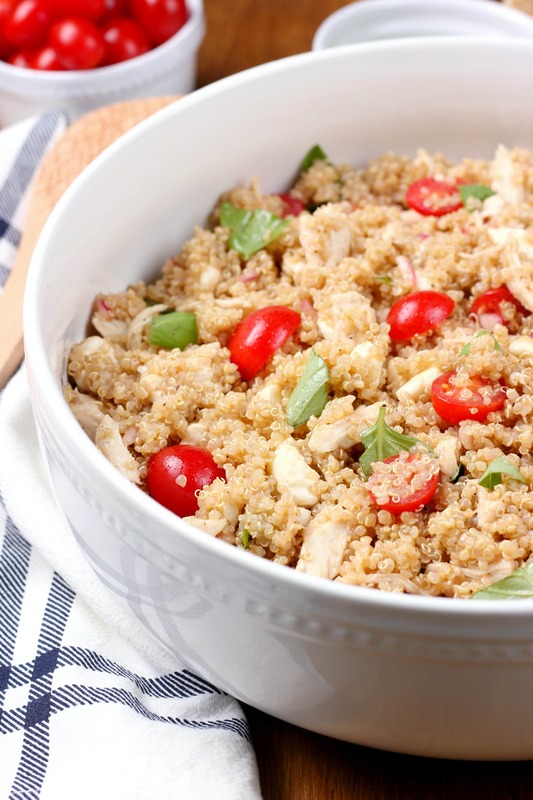 To make this easy salad more filling, shredded chicken is added! It’s that time of year when our gardens and farmer’s markets are overflowing with all kinds of good produce! We love walking out to our garden before meals to pick produce to use. As kids start to head back to school and stores are showcasing all things fall, we’re clinging to summer by trying to spend as much time as possible outside and trying to eat as much fresh produce as we can! One way we’ve being doing that is making salads. Sometimes they’re lettuce based, sometimes they’re pasta based, and sometimes they’re quinoa based. 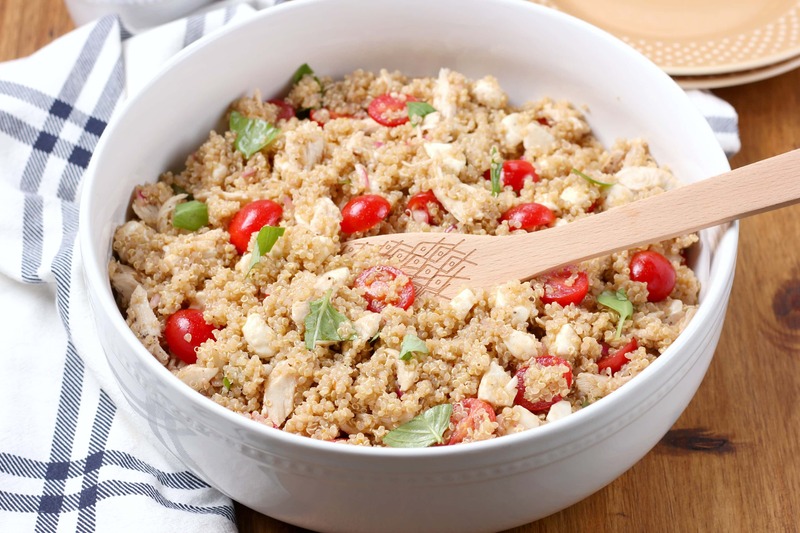 Like this chicken caprese quinoa salad! This salad is all about fresh flavors. Fresh tomatoes, fresh basil, fresh mozzarella! Since we have both tomatoes (and they’re kind of out of control!) and basil in our garden, we’ve been enjoying this combo frequently. To make this salad a little heartier, we added in some shredded chicken. 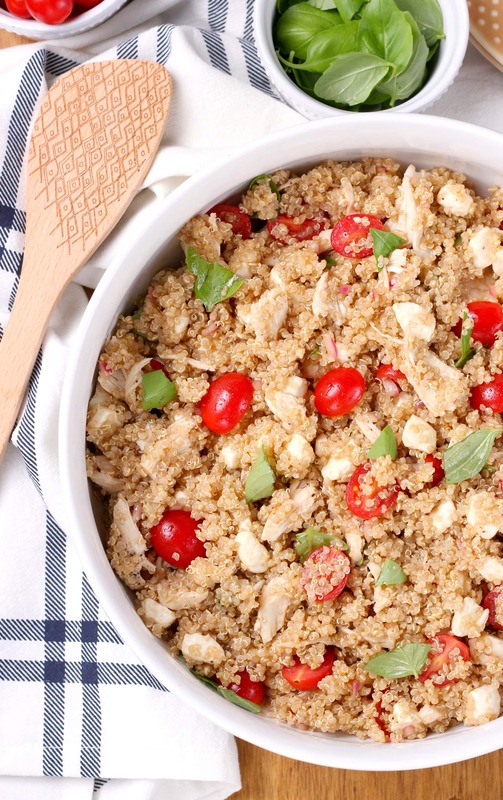 If you have leftover chicken that you don’t know what to do with, throw it in this salad! Or use rotisserie chicken! We like to keep it simple. The dressing is made up of olive oil, balsamic vinegar, fresh lemon juice, and minced garlic. Just enough flavor to add something to the salad without over powdering the fresh ingredients. This salad is perfect for busy weeknights. And now that school is starting back up for a lot of people, I’m sure we could all use some new easy recipes! Healthy, hearty, and best of all, delicious, your family will love this! In a small bowl, whisk together all ingredients for the dressing until well-combined. Pour over quinoa and stir until quinoa is completely covered. Stir in shredded chicken, cherry tomatoes, mozzarella, basil, and red onion until combined. Such a great salad to make ahead and have on hand for the week too! Love all the fresh flavors in this dish! Sure to become a favorite! This salad is beautiful! My favorite flavor combination! 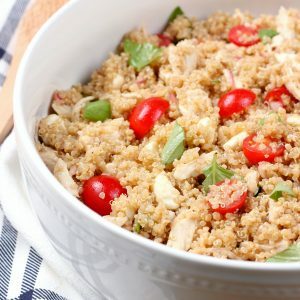 I’ve been on a huge quinoa kick lately and this caprese salad sounds delicious! I cannot get enough of tomatoes right now! The salad looks so tasty! I am gonna try this! Wish me best of luck!